The Fuel is the open-forum, student newspaper for Judson High School in Converse, Texas, a suburb of San Antonio, Texas. The organization is advised by Mr. Pedro Cabrera and consists of about 13 student journalists. The department also produces four physical copies of the newspaper, the school’s yearbook, The Rocket, as well as a wide range of journalistic photos. The organization is completely student ran. The journalism department and student journalists own all content produced by the organization. Journalism is a vital profession for the health and operation of a democratic society. People need to be informed about what is happening around them. Journalists are people trained to witness important events and tell the story through the power of the written word and/or photography. 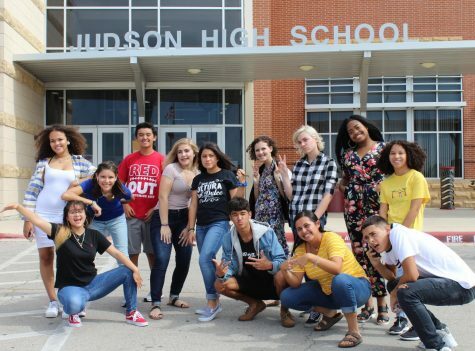 Our students are beginning their journey to becoming professional journalists by reporting on the events and people at Judson High School and the Converse community. Judson High School is a public, 4-year high school in Converse, Texas. It was established in 1959 and is now one of three comprehensive high schools in the Judson Independent School District. The school serves approximately 3,000 students, which makes it one of the largest high schools in San Antonio. It has been recognized as a National Blue Ribbon School and an International Baccalaureate World School. Jesus Hernandez III serves as principal to Judson High School. Judson Independent School District is a public school district located in the San Antonio, Texas area. It serves seven different municipalities: Converse, San Antonio, Selma, Universal City, Kirby, Schertz, and Live Oak. The district’s superintendent is Dr. Jeanette Ball. Very few students are part of an organization in which their homework is published and up for criticism. Please be aware that The Fuel newspaper and The Rocket yearbook are student-created publications made in a journalism education lab setting. We regret that errors can and will occur. If you wish to contact The Fuel, email Mr. Cabrera at [email protected], or call Judson High School at 210-945-1100.